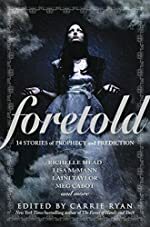 Foretold: 14 Stories of Prophecy and Prediction by Carrie Ryan. Review: Crystal balls, oracles, prophecy, prediction. Has prophecy and prediction ever interested you? Well Foretold would be a great book for you. The book Foretold is written by Richelle Mead, Lisa McMann, Laini Taylor, Meg Cabot, and about six or seven more authors. The book is not in any series and is edited by Carrie Ryan. Since the book is written by many authors and has many stories I'll just name a few of the characters. From Gentlemen Send Phantoms, there's Pippin or ÒCathyÓ. From Out of the Blue there's Kc Conrad and Kyle Conrad. Again because the book is many stories I'll go over a few of my likes. One of my favorite stories is called The Chosen One by Saundra Mitchell; it's about a girl named Corvina who is the princesses' bed mistress. So the princess gets ill and Corvina is forced to go on a quest involving 'Óthe fabled cupÓ, flaming witches, breathless reaches, and an Earthenwork defiler. This particular story is good in my opinion because it has a satisfying ending, is full of action, and has believable characters. But just to give a small overview, all of the stories have something to do with prophesy and prediction. But with the good comes bad, some of the stories might be exciting to you ,but if you like fantasy and adventure like me, I don't think that you'll find this book pleasing to read. I guess it's because the stories are short but almost all of the characters are flat and static. Also, some of the plots are predictable and have frustrating endings. But then again a lot of the themes were important in my eyes. Like never give up, and most of the time you should wait before you act. I would rate this book a 6 out of10. The mystical art of prophecy, will it ever be revealed? We would like to thank Random House for providing a copy of Foretold: 14 Stories of Prophecy and Prediction for this review. Have you read Foretold: 14 Stories of Prophecy and Prediction? How would you rate it?